Zoho Projects is the complex project management software with rich functionality. It will be great for those who need advanced reporting and tracking, file sharing and communication functionality. Zoho Projects offers Gantt Charts, Task Dependencies, and Time Tracking as basic features and multiple paid extras like Wikis, Chatrooms and Bug Tracking Tool, etc. File Sharing and Google Docs Integration. Zoho Projects allows grouping, commenting, searching and versioning the documents. You can connect with your Google account to use your Google Docs in Zoho Projects and edit them without leaving Zoho. Time Tracking. The timesheet features in Zoho Project allow you to enter the hours manually or track the work hours with the little time clock, set for the task. Email Integration. The email integration allows adding tasks for the project, updating the task status, uploading documents and adding forums. A specific “alias” e-mail address is created for each project that allows for this extended functionality. Gantt Charts. 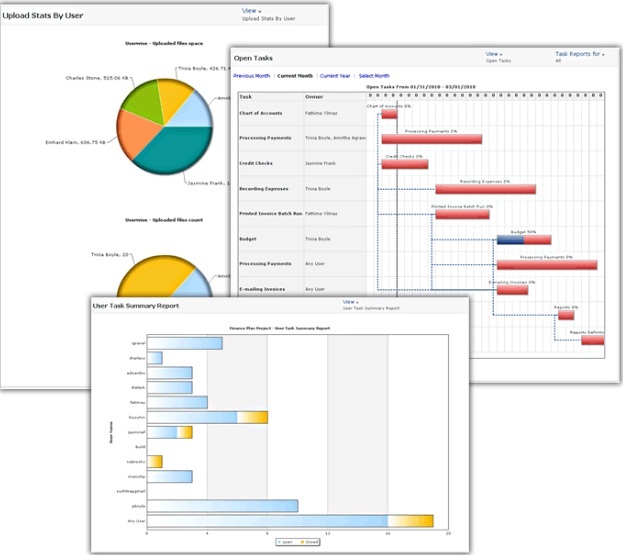 The Gantt view is available in Tasks and Milestones tabs. 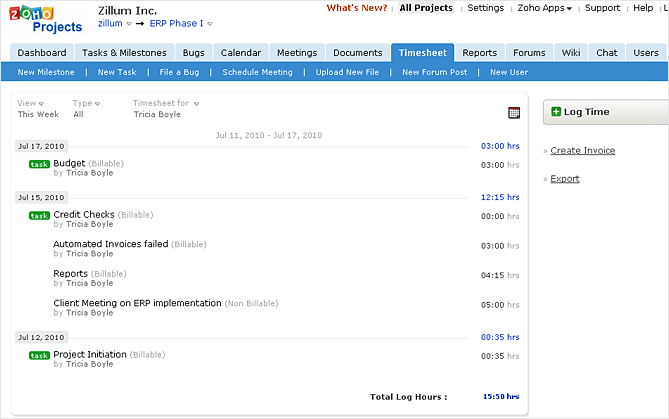 You can edit the Gantt Chart in the Gantt View if you will upgrade to Premium or Enterprise package of the Zoho Projects. Expense Tracking. 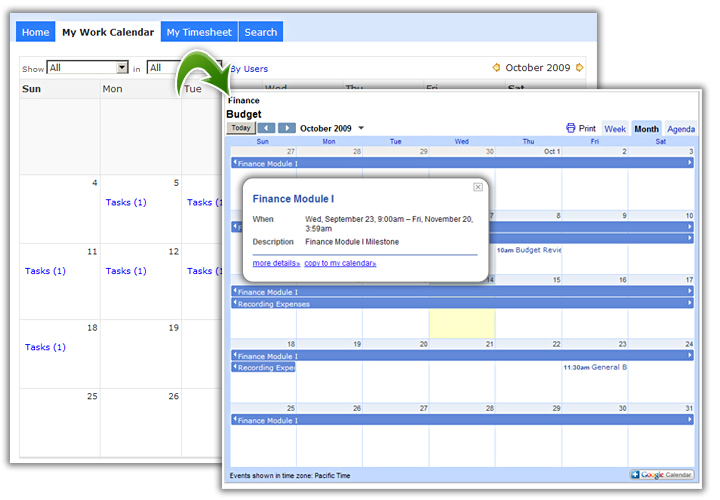 You can track billable and non-billable time, as well as build advanced resource utilization charts in Zoho Projects. Reporting and Analysis. Extended reports within each project can be made in Zoho Projects. The Enterprise package has the Report tab across all pages for maximum usability. Web-Based. 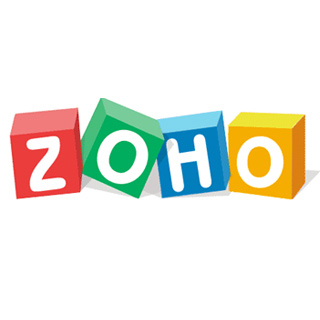 Zoho Projects is a web based application. Currently the company is working on the Mobile version of the application. There are several add-ons for the desktop integration, yet the desktop version of the application is not expected in future. Other Features.With Zoho you can perform complete task management: set task dependencies and milestones for the project in Zoho Projects, set recurring tasks and add multiple wikis.